^ Herrmann JM, Neupert W (2000 April). “Protein transport into mitochondria”. Curr Opin Microbiol 3 (2): 210–214. doi:10.1016/S1369-5274(00)00077-1. PMID 10744987. ^ Hayashi T, Rizzuto R, Hajnoczky G, Su TP (February 2009). “MAM: more than just a housekeeper”. Trends Cell Biol. 19 (2): 81–8. doi:10.1016/j.tcb.2008.12.002. PMC: 2750097. PMID 19144519. https://www.ncbi.nlm.nih.gov/pmc/articles/PMC2750097/. ^ Chipuk JE, Bouchier-Hayes L, Green DR (2006). 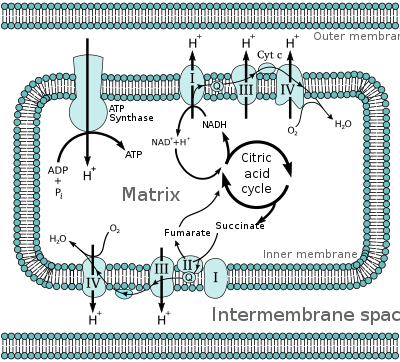 “Mitochondrial outer membrane permeabilization during apoptosis: the innocent bystander scenario”. Cell Death and Differentiation. 13 (8): 1396–1402. doi:10.1038/sj.cdd.4401963. PMID 16710362. ^ Mannella CA (2006). “Structure and dynamics of the mitochondrial inner membrane cristae”. Biochimica et biophysica acta 1763 (5–6): 542–548. doi:10.1016/j.bbamcr.2006.04.006. PMID 16730811. ^ Stoimenova M, Igamberdiev AU, Gupta KJ, Hill RD (July 2007). “Nitrite-driven anaerobic ATP synthesis in barley and rice root mitochondria”. Planta 226 (2): 465–74. doi:10.1007/s00425-007-0496-0. PMID 17333252. ^ Monty Krieger; Matthew P Scott; Matsudaira, Paul T.; Lodish, Harvey F.; Darnell, James E.; Lawrence Zipursky; Kaiser, Chris; Arnold Berk. Molecular Cell Biology, Fifth Edition. San Francisco: W. H. Freeman. ISBN 0-7167-4366-3. ^ Huang, K.; K. G. Manton (2004). “The role of oxidative damage in mitochondria during aging: A review”. Frontiers in Bioscience 9: 1100–1117. doi:10.2741/1298. PMID 14977532. ^ Mitchell P, Moyle J (1967-01-14). “Chemiosmotic hypothesis of oxidative phosphorylation”. Nature. 213 (5072): 137–9. doi:10.1038/213137a0. PMID 4291593. ^ Mitchell P (1967-06-24). “Proton current flow in mitochondrial systems”. Nature. 25 (5095): 1327–8. doi:10.1038/2141327a0. PMID 6056845. ^ Mozo J, Emre Y, Bouillaud F, Ricquier D, Criscuolo F (2005 November). “Thermoregulation: What Role for UCPs in Mammals and Birds?”. Bioscience Reports. 25 (3-4): 227–249. doi:10.1007/s10540-005-2887-4. PMID 16283555. ^ a b Editor-in-chief, George J. Siegel; editors, Bernard W. Agranoff... [et al. ]; illustrations by Lorie M. Gavulic (1999). Siegel GJ, Agranoff BW, Fisher SK, Albers RW, Uhler MD. ed. Basic Neurochemistry (6 ed.). Lippincott Williams & Wilkins. ISBN 0-397-51820-X. ^ Rossier MF (2006). “T channels and steroid biosynthesis: in search of a link with mitochondria”. Cell Calcium. 40 (2): 155–64. doi:10.1016/j.ceca.2006.04.020. PMID 16759697. ^ Pizzo P, Pozzan T (2007 October). “Mitochondria–endoplasmic reticulum choreography: structure and signaling dynamics”. Trends Cell Bio. 17 (10): 511–517. doi:10.1016/j.tcb.2007.07.011. PMID 17851078. ^ a b Miller RJ (1998). “Mitochondria – the kraken wakes!”. Trends in Neurosci. 21 (3): 95–97 doi=10.1016/S0166–2236(97)01206–X. doi:10.1016/S0166-2236(97)01206-X. ^ Jukes TH, Osawa S (1990-12-01). “The genetic code in mitochondria and chloroplasts”. Experientia. 46 (11–12): 1117–26. doi:10.1007/BF01936921. PMID 2253709. ^ Hiesel R, Wissinger B, Schuster W, Brennicke A (2006). “RNA editing in plant mitochondria”. Science. 246 (4937): 1632–4. doi:10.1126/science.2480644. PMID 2480644. ^ Wiesner RJ, Ruegg JC, Morano I (1992). “Counting target molecules by exponential polymerase chain reaction, copy number of mitochondrial DNA in rat tissues”. Biochim Biophys Acta 183 (2): 553–559. PMID 1550563. ^ John P, Whatley FR. (1975). “Paracoccus denitrificans and the evolutionary origin of the mitochondrion.”. Nature 254 (5500): 495-498. PMID 235742. ^ a b Yang D, Oyaizu Y, Oyaizu H, Olsen GJ, Woese CR. (1985). “Mitochondrial origins”. Proc Natl Acad Sci 82 (13): 4443-4447. PMID 3892535. http://www.pnas.org/content/82/13/4443.full.pdf. ^ a b Viale AM, Arakaki AK. (1994). “The chaperone connection to the origins of the eukaryotic organelles.”. FEBS Lett. 341 (2-3): 146-151. PMID 7907991. ^ Andersson SG, Zomorodipour A, Andersson JO, Sicheritz-Pontén T, Alsmark UC, Podowski RM, Näslund AK, Eriksson AS, Winkler HH, Kurland CG. (1998). “The genome sequence of Rickettsia prowazekii and the origin of mitochondria.”. Nature 396 (6707): 133-140. PMID 9823893. ^ Rappe et al. (2002). “Cultivation of the ubiquitous SAR11 marine bacterioplankton clade”. Nature 418 (6898): 630-633. PMID 12167859. ^ Williams KP, Sobral BW, Dickerman AW. (2007). “A robust species tree for the alphaproteobacteria.”. J Bacteriol. 189 (13): 4578-4586. PMID 17483224. http://jb.asm.org/cgi/reprint/189/13/4578.pdf. ^ Hayashi, J., et. al. (2008). “ROS-generating mitochondrial DNA mutations can regulate tumor cell metastasis”. Science 320 (5876): 661-664. PMID 18388260.